Syrian Democratic Forces made additional, limited advances against the Islamic State, inside of Shahada district. Clashes between SDF and IS also took place in Al-Rawdah district. According to Amaq’s statement, IS launched a counterattack in the eastern part of Raqqa. The counterattack focused on Abu al-Hayes street and allegedly resulted in death of seven SDF‘s fighters, injury of another five, and recapture of several positions. Another IS’ counterattack was reported, in the vicinity of Al-Sawary school in the northeastern Raqqa. The attack resulted in death of a SDF‘s fighter and injury of another one. CJTF-OIR‘s airstrikes and US’ artillery have killed eight and injured 43 civilians, during the past two days in Raqqa, according to Amaq Agency’s statement. Another statement from Amaq claimed CJTF-OIR‘s airstrike mistakenly targeted SDF‘s fighters near the Panorama roundabout. Syrian Arab Army captured Rumaylan village and Rumaylan Dam from the Islamic State, as well as, advanced around 10 kilometers (~6.2 miles) east of Dubaysan oil field, capturing several wells and oil fields. Yesterday, IS’ SVBIED hit SAA‘s position near the village of Al-Zamlah, allegedly destroying a tank and a machine gun position. IS also launched a raid yesterday, on the Raqqa – Ithriyah road, killing eight SAA‘s soldiers, according to Amaq. Yesterday, Islamic State’s improvised explosive device reportedly killed three SDF‘s fighters, in the vicinity of Daeibil village, east of Al-Shaddadi. 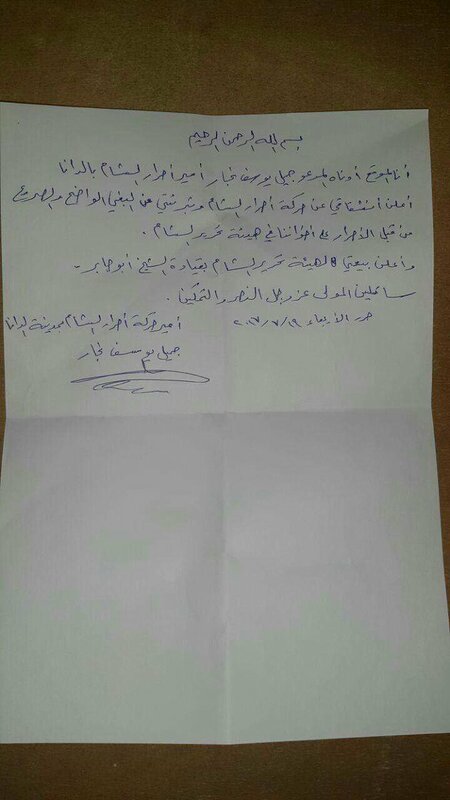 Clashes between Hayat Tahrir al-Sham and Ahrar al-Sham erupted across the Idlib governorate, the former released a statement accusing the latter of declaring the war on HTS. HTS got the upper hand in the fighting today as it has fully cleared several localities from Ahrar al-Sham, including Harim, Azmarin, Al-Dana, Al-Habait, Tel Ammar, Saraqib and Sarmada. Ahrar al-Sham only managed to secure Isqat village, and briefly hold Salqin, before it was recaptured by HTS. However, during their short stay in Salqin, Ahrar al-Sham’s fighters arrested foreign HTS‘ official from Tunisia, Abu Hafs al-Tunisi, who was wounded in today’s clashes. Ahrar al-Sham’s official from Al-Dana, Jamil Yousef Najar, defected to Hayat Tahrir al-Sham, as the latter captured the locality. Commander in Ahrar al-Sham’s Liwa Al-Abbas, Abu Zaid, was killed by HTS in Al-Maghara village, Jabal al-Zawiya area. Ahrar al-Sham arrested 12 HTS‘ fighters in Armanaz. Shortly after that, the vicinity of Ahrar’s HQ in the locality was targeted by a VBIED. The explosion killed three civilians, according to the reports. The city of Harim was also hit by a VBIED, without known reports about casualties. The people of Maarrat Misrin, Kafr Nabl, and Hass protested against the clashes between Ahrar al-Sham and Hayat Tahrir al-Sham. Anti-HTS demonstration was held in Saraqib, which was captured by HTS today. HTS‘ fighters opened fire on demonstrators, killing media activist Musab al-Ezzo. Today’s confrontations between HTS and AAS have allegedly resulted in at least 10 dead rebel fighters. As a result of these clashes, Turkey closed Bab al-Hawa border crossing. Amaq Agency released a statement reporting death of five Syrian Arab Army’s soldiers near the village of Dakila, after clashes with the Islamic State. Islamic State and Syrian Arab Army clashed on several fronts in the eastern Homs governorate, Amaq Agency claimed death of 25 SAA‘s soldiers, and destruction of at least two vehicles, due to Islamic State’s attack on Waid al-Waer area, near the Iraqi border. The two aforementioned parties also clashed east of Al-Hail gas field, which was captured by the Syrian Arab Army on the 8th of July. IS’ Amaq Agency reported death of 19 SAA‘s soldiers and destruction of two tanks, during the encounter with the Islamic State. Syrian Arab Army launched an attack on Al-Rayhan in East Ghouta, held by Jaysh al-Islam. The attack was backed by at least five raids from the Syrian Arab Air Force, six raids also targeted the neighboring Al-Shifuniya. Even though SAA had air support and heavily shelled the area with artillery and six surface-to-surface missiles, Jaysh al-Islam repelled the intrusion attempt. During today’s clashes on Al-Rayhan front, SAA‘s T-72 tank was damaged and its crew injured. SAA‘s casualties from the failed attack have been reported at over a dozen, but Jaysh al-Islam released a “photo report” showing only two killed soldiers. Syrian Arab Air Force carried out three raids over Al-Marj area, and two raids over Ain Terma. Commander in the Free Syrian Army’s Jaysh Usud al-Sharqiya, Shibli Khalifa, was assassinated by unknown gunmen in Al-Dumayr. South of Mosul, near Al-Shura intersection, Islamic State’s improvised explosive device destroyed a vehicle carrying members of the Iraqi Federal Police. Islamic State and Al-Hashd al-Shaabi (Popular Mobilization Units) are still clashing in and around the village of Imam Gharbi. Islamic State reportedly destroyed a Humvee with an RPG, at the outskirts of the village. 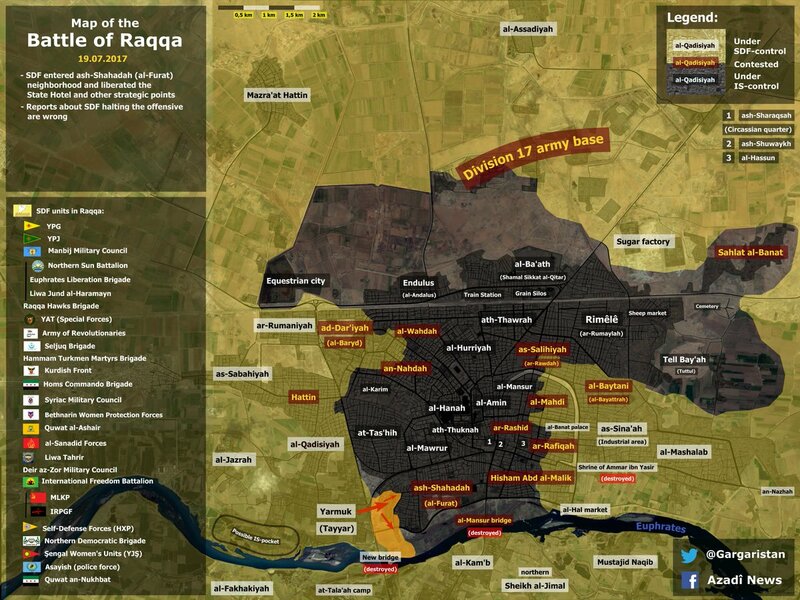 Imam Gharbi village was reported as captured by the Iraqi forces from the Islamic State. Situation in / Map of Nineveh governorate, according to the Iraq Joint Operations. Islamic State raided Al-Hashd al-Shaabi’s positions on Jabal Ealas, destroying four vehicles during the attack. Jabal Ealas is located southwest of Kirkuk. Kilo 50 area, west of Al-Rutbah, was targeted by the Islamic State’s fighters, who reportedly killed an Iraqi soldier and destroyed Iraqi Army’s Humvee. Iraqi security forces located and detonated 33 improvised explosive devices, left behind by the Islamic State in Al-Zaidan area, west of Baghdad. Furthermore, eight mortar rounds were seized. Iraqi Army’s 1st Regiment of the 6th Brigade, safely detonated an improvised explosive device near a road in Al-Shaela district, Baghdad. On the 18th of July 2017 CJTF-OIR has conducted 17 strikes in Syria. CJTF-OIR‘s main focus in Syria at the moment is Raqqa region where they did 12 strikes supporting SDF‘s operations against IS destroying nine fighting positions, two vehicles and a tactical vehicle. Other areas where five airstrikes occurred are Abu Kamal (Al-Bukamal), Al-Shaddadi and Deir al-Zour, destroying two oil storage tanks, two vehicles, a well-head, an IS command and control node and six IS oil stills. Full report on CJTF-OIR strikes conducted in both Syria & Iraq can be found here. Islamic State reportedly assassinated five Shia Hazara people on the road between Mustawnik directorate and Karachi city, southwestern Pakistan. Islamic State clashed with the Philippine Army in Llod Madaya district of Marawi city, reportedly killing 10 Filipino soldiers. Another statement from Amaq Agency claimed death of a Filipino officer and injury of another one, during the clashes in Marinot district.